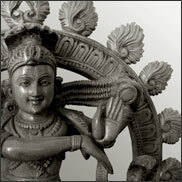 Ashtanga Yoga & meditation classes for business environments, corporate events and functions. Improve the well-being and productivity of your workforce! Would you like employees in your organisation to be healthier, less stressed, mentally stronger, more creative, more confident and more flexible? The regular practice of Yoga improves physical, mental and emotional well-being; key factors in creating and maintaining a happy, healthy and productive workforce. Though Yoga we calm the mind and develop a greater sense of self-awareness by exploring our bodies and the nature of our inner being. As this occurs participants develop a strong relationship with their inner world allowing their inherent personal strengths to emerge with a fresh self-confidence. Corporate Yoga is more than just exercise and relaxation; more than a conventional course in stress management; more than just a stretch class. It is a complete personal growth programme that will balance the mind, body and emotions of your employees, leaving them relaxed, alert and eager to contribute to the success of your company. Depending on your needs, an introductory Yoga program normally includes a series of classes running for 8-10 weeks. This can then be followed with ongoing Yoga classes as desired. Sessions are tailored to each group's requirements and typically last from 60 to 90 minutes. These can be held at a time that best suits your organization and those who wish to participate, such as late morning/lunchtime, or just after work. All of which will give your staff and company enhanced performance in the commercial world. ...if you are a company committed to investing in its people all you need is a group of 10–12 (or more) employees interested in attending a yoga class, a suitable room, large enough for the number of participants and we’ll provide the rest! Program costs are determined according to the nature of the particular program that is developed. No prior experience of yoga is necessary; classes are suitable for all levels . 1/2 or full-day workshops are ideal for team building, stress management, company away days and before or after social events. A highly specialised 30 or 60 minute Corporate Yoga Workshop can be a refreshing way to energise training days for staff or visiting clients and a useful way of maintaining interest during day long conferences or lengthy meetings.